Winemakerssister: Ruby Does It Again! 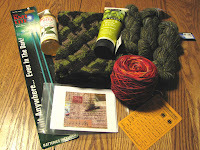 Miz Ruby Colorway (the nom de swap of my secret pal) has done it again! Last month she sent me the most amazing package... and this month's package was just as terrific. She obviously has been stalking me quite thoroughly, for everything is absolutely perfect. 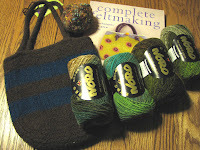 Gorgeous yarns -- soft merinos in luscious colors, 4 skeins of Noro for felting, books & a magazine (I accidentally left two out of the photo), beautiful handmade goodies from Etsy shops (a lovely felted bag, entrelac scarf, collaged notecard), the cutest wine-cat poster, light-up needles... and on and on. Oh, and a sweet little felted bowl (did you make it?). Thank you so much, Ruby. You're the best! Hi Heather! Just wanted to check out your blog and let you know that I received your cupcake fabric today! Love it! So cute! Wow! I don't think that I want to ever be in a swap. What a commitment to send out lovely stuff like this. 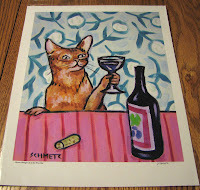 Oooh lovely...that wine cat poster is fabulous...and didn't even know that light up needles existed!